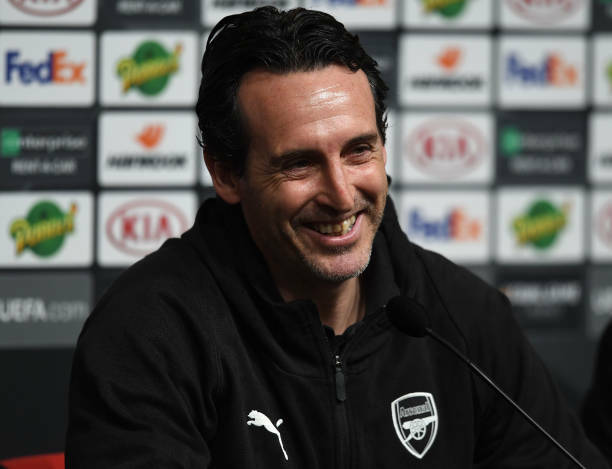 Arsenal head coach Unai Emery will probably make some changes to the starting eleven that faced Manchester United on Sunday. It will be interesting to see if Rennes will hold Arsenal at the Emirates Stadium. Arsenal will this evening welcome Rennes at the Emirates Stadium and they will be hoping to progress to the UEFA Europa League quarter finals. Arsenal’s head coach Unai Emery will of course make some changes to the squad that beat Manchester United 2-0 so here’s the predicted starting eleven to face Rennes. Petr Cech has been in between the goal posts of Arsenal in most of their UEFA Europa League matches this season so Unai Emery will not be changing that today because of Bernd Leno’s impressive performance on Sunday. The Czech Republican international will need to put on a good performance because them conceding a goal at home will see them get knocked out of the competition. Unai Emery used three at the back on Sunday in Arsenal’s 2-0 win over Manchester United and the boss will probably use it again in today’s match but Sokratis is however unfortunately suspended. So Arsenal’s back three will consist of Mustafi, Koscielny and Monreal. The gunners used wingbacks on Sunday against Manchester United so Maitland-Niles and Kolasinac will once again be expected to drive through those flanks so that they can send in crosses to their two strikers upfront. These two will be responsible for moving the ball on the flanks because Mkhitaryan and Iwobi could start on the bench. Matteo Guendouzi had a poor performance in the first leg vs Rennes so he won’t be in the starting eleven, Lucas Torreira is expected to get partnered with Granit Xhaka in the midfield to connect Arsenal’s defence and attack. If Unai Emery is to use the above formation then Aaron Ramsey will be picked over Mesut Ozil to play as Arsenal’s central attacking midfielder, behind the two strikers. Lacazette and Aubameyang will start as Arsenal’s strikers today because the North Londoners will be hoping to score many goals. A quick goal will be very crucial for the gunners since the first leg ended 3-1 in favour of Rennes.